Caterpillar set a dreaded 52-week low today as dismal news on durable goods, new home sales and unemployment blistered the bulls. Full quote at Yahoo Finance. Broader markets took the news about as expected: Dow, down 2.7%; Nasdaq, down 3.24%; S&P 500, down, 3.31%. Today’s wrap-up at Market Watch. 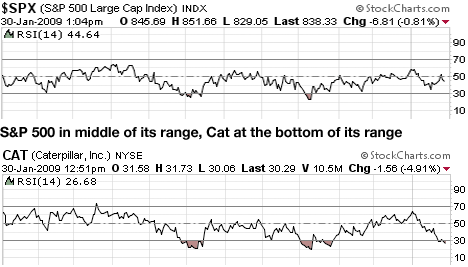 Cat’s volume of 14.4 million shares was notch above normal, but not really enough to tell us much. Selling inched the support level down but did not blast through it, which seems at least borderline positive. Still waiting for that Obama bounce everybody promised. 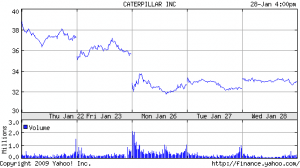 Caterpillar gapped up a couple percentage points at the open and took a long winter’s nap the rest of the day, drifting downward to close a bit off its high for the day. Full quote at Yahoo Finance. Financials led the broader markets higher as traders convinced themselves the bad news is all priced in. Dow, up, 2.46%; Nasdaq, up 3.55%; S&P500, up 3.36%. Wrap-up at Market Watch. 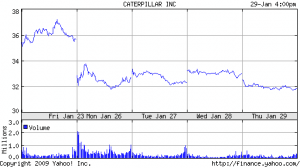 Cat’s volume was back to normal at 12.9 million shares. Two small up days in a row feel like a playoff win after what we’ve been through. I’m skeptical of any bull run led by the financials, which got is into this mess and will not get us out, but there’s good cheer in the tech stocks outperforming. That’s at least a semblance of normalcy.